The intersection of Grand Avenue and Dodier Street on the north side of St. Louis is one of the fabled locations in baseball history. Amateurs began playing on a sandlot there as far back as the 1860s. In the winter of 1908-09 Sportsman's Park, a dilapidated wooden structure, was rebuilt and extensively renovated and modernized. The new concrete and steel park served as the center of professional baseball in St. Louis for the next six decades. The home of the Browns and — beginning in July 1920 — the Cardinals, Sportsman's Park hosted more than 7,000 major-league games. This book rekindles memories of the venerable ballpark through detailed summaries of 100 games played there from 1909 through 1966. There are also insightful feature essays about the park's history. This volume is a collaborative effort of 40 members of the Society for American Baseball Research (SABR). Contributors include: Mark Armour, John Bauer, Phillip Bolda, Frederick C. "Rick" Bush, Ken Carrano, Alan Cohen, Richard Cuicchi, Greg Erion, Doug Feldmann, Scott Ferkovich, Dan Fields, Jeff Findley, James Forr, Gordon J. Gattie, Chip Green, Tom Hawthorn, Mike Huber, Dwayne Isrig, Norm King, Russ Lake, Len Levin, Kellen Nielson, Bill Nowlin, Dennis Pajot, Ryan Parker, J.G. Preston, Richard Riis, C. Paul Rogers III, Joe Schuster, Lyle Spatz, Steve Steinberg, Mark S. Sternman, Cecilia Tan, Doug Walden, Joseph Wancho, John J. Watkins, Mike Whiteman, Jim Wohlenhaus, Gregory H. Wolf, and Brian P. Wood. E-book: Click here to download the e-book version of Sportsman's Park in St. Louis for FREE from the SABR Store. Available in PDF, Kindle/MOBI, and EPUB formats. Paperback: Get a 50% discount on Sportsman's Park in St. Louis paperback edition from the SABR Store ($15.99 includes shipping/tax). E-book: Click here to purchase the e-book version of Sportsman's Park in St. Louis for $9.99 from the SABR Store. Available in PDF, Kindle/MOBI, and EPUB formats. 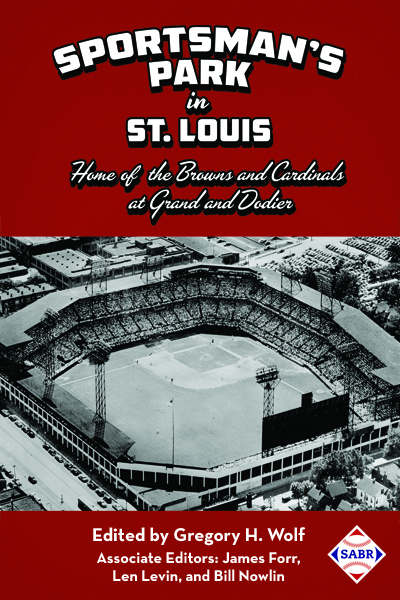 Paperback: Get the paperback edition of Sportsman's Park in St. Louis from the SABR Store ($30.99 includes shipping/tax). This page was last updated October 29, 2018 at 12:49 am MST.